On some bookmaker sites you will see the time when book closes. Read this post to get answer. It’s very simple to understand. Traditionally, before online sports betting existed, bookies used to keep a book with all bets taken with other details and hence they are called bookmakers or bookies in short. Your local bookies still keep such book. They used to have a set time, before match started, till they accepted the bets. After this time they didn’t accept any more bets and this time was called closing time. The same tradition is carried on by online sports bookmakers. In simple terms this is the time till they will accept the bets and afterwards they will close the book and not accept any more bets. They will also remove this event/market from their website. The book doesn’t close for the events/markets which turn in play (live betting). When an event or market turns in play (live betting) the book remains open. 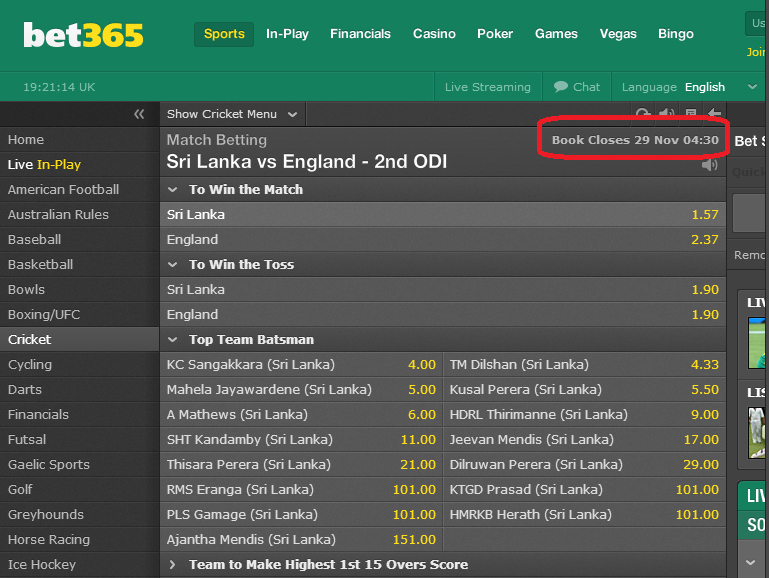 Any unmatched bats will remain unmatched or will be cancelled depending on whether you have selected to keep the bets or not when event/market turns in play. Munnabhai can you tell me how i can verified bet365 account? You can take premium membership and read those guides. I’ve written everything there.